The Christmas holidays are a wonderful season full of family gatherings. If your home seems to be homebase to many of these events, you may feel overwhelmed trying to prepare your home to receive guests. You are not alone. 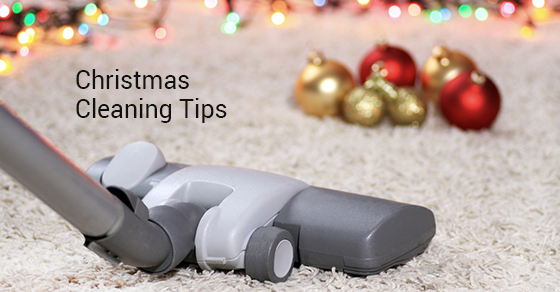 To help you with this seasonal task, we have prepared a list of quick tips to get your home cheerfully clean for the Christmas crowd! Declutter. If you minimize the knickknacks out and about in your home’s common areas, there will be less to organize and tidy before and after events. Streamline what you want out for necessity and what you want for decor and leave it at that. You can always pull out the old magazines and kids’ art post-holiday haze. Make a checklist. Design a room-by-room plan and have an order from top-down, inside-out to clean and organize. Get all the monthly big ticket items completed first, such as washing windows and baseboards, steam cleaning rugs, and keep up with smaller tasks weekly, such as dusting and vacuuming. Be sure to stock up on cleaning products to be ready for spills and stains, especially when having the kids over to visit! Pre-Christmas. If you have special glassware, flatware, and dishes that you plan to use, but don’t see the light of day too often, be sure to clean/rinse these with ample time to dry before guests arrive. Wash and iron all holiday linens and towels in advance, don’t spend those precious last days of shopping folding laundry! This goes for special ornaments and holiday outfits you want to use as well. Take them out from storage early and make sure they are ready for use. Have a gameplan for mess! Have stations set up for recycling, garbage, and dishes post meals and gifts. Let guests know where things go, it’s okay to direct traffic to keep a clean space and room to continue entertaining. Try to wash dishes and put away dinner while you have the help of a few guests at larger gatherings to prevent leaving a big job for yourself at the end of a long day. Daily To Dos. With a constant flow of guests the important things to check daily include bathrooms (stock toilet paper, soap, fresh hand towels and empty rubbish. Clean sink and toilet and check air freshener) and guestrooms (fresh linens, vacuum the floor, dust and do a once over to make sure it’s always ready to receive company. Post-Christmas. Remember to clean all special dishes, glassware and cutlery as well as ornaments and linens and put them away ready for use at the next big event. Dry clean necessary items and put away in safe storage. Check bulbs of light strands and replace faulty ones before placing in storage. Dust tree and decor and package away for next year. The more organized you put things away, the easier it will be to start all over again next time! Happy Holidays!